Dedicated to inclusivity, Glenwood Sunday Market will use their grant programs to create and distribute SNAP program promotional materials in Spanish with the goal of engaging the 25% of their community that is Spanish-speaking. Keya Wakpala Farmers’ Market is a small market that has invested multiple years in growing their SNAP program. Grant funds will be used to replace their Novo Dia equipment and capitalize on the time and resources they have spent to make local food accessible to their low income consumers. Raisin Roots is a family farm dedicated to serving SNAP customers, even reserving 25% of their CSA shares for low-income consumers. They will use the grant funds to leverage their existing connections in their community to market the program, as well as purchase new equipment. 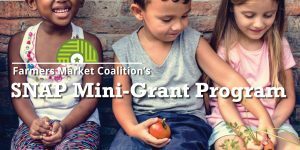 What is the SNAP Mini-Grant Program? Earlier this summer, farmers markets across the nation received shocking news: Novo Dia Group (NDG), the country’s largest processor of SNAP EBT at farmers markets announced its plans to go out of business. That meant unless a solution was quickly found, nearly 2,000 markets nationwide would lose the equipment and services necessary to accept SNAP, harming the bottom-line of farmers who depend on those sales and the low-income families who rely on farmers markets for fresh, affordable food. In response, FMC launched a fundraising campaign to support SNAP EBT programs at impacted farmers markets and farm stands. Through your generous donations, FMC created a $500 SNAP Mini-Grant Program and invited impacted markets and farmers to apply. This program was established to help recipients cover the unexpected and burdensome cost of purchasing new SNAP EBT equipment and support other SNAP program related needs created by the shutdown. Each grant recipient clearly outlined how the NDG shutdown would impact their market or farm, demonstrated a deep commitment toward making healthy, local food available to SNAP shoppers in their community, and illustrated how the Mini-Grant funds would support the long term sustainability of their SNAP programs. While financial aid from the State of New York stalled the impending closure, and made it possible for NDG to provide service to its customers through February 2019, many markets are still scrambling for funding to replace their SNAP EBT equipment. In an effort to ensure all impacted markets and farmers are offered a chance to apply for funding, we are extending the application deadline to October 19, 2018, and are opening up the SNAP Mini-Grant Program to applicants nationwide. 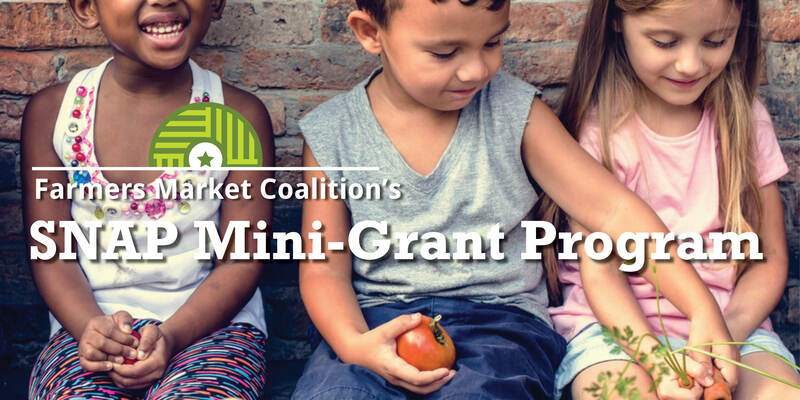 If your market or farm stand operates a SNAP program, and needs help replacing equipment or covering the costs of your SNAP program as a result of the shut down, please visit https://farmersmarketcoalition.org/farmers-market-mini-grant-application/ to apply to the SNAP Mini-Grant Program. Please note: if you applied before today, your application is still eligible for the next round. Please do not submit a second application if you have already submitted one. We aim to announce our next round of Mini-Grants recipients by November 2, 2018! Want to be a champion for local, fresh, affordable food? Hundreds of farmers markets across the country are still in need of support. Help even more markets connect local farmers with SNAP families in their community by donating to the SNAP Mini-Grant Program today! We would like thank each and every donor who made our SNAP Mini-Grant Program possible. Your support makes a difference! We look forward to sharing the great work that results from these funds. FMC initially invited a select group of markets and direct-marketing farmers to apply, but are now opening it up to applicants nationwide that have, or previously had, Novo Dia equipment. Please note funding is limited, and applications will be reviewed on a first-come first-served basis, with need in mind. Will FMC only consider markets and farmers impacted by the Nova Dia shutdown? While those affected by the Novo Dia shutdown will get priority, we are also aware FIS recently retired a terminal that many markets were using. We will consider any SNAP-related hardship as long as it is clearly defined in your application. Applications will be accepted on a rolling basis until October 19th, 2018, or until funds are depleted. To be considered, please submit your application at your earliest convenience. Is there any required reporting? All selected grantees will be required to submit a brief report to FMC within three to six months of receiving funds. Further reporting details will be provided to grant awardees. I have additional questions. Who do I ask?